Like the Nikon D5300 that replaces it, the Nikon D3300 below it in the Nikon SLR range and the Nikon D7100 above it, the D5200 has a CMOS sensor with 24 million pixels. However, some may be surprised to learn that Nikon doesn't use exactly the same sensor in these camera. The Nikon D5200 uses a 24.1 effective megapixel sensor that has not been seen elsewhere. 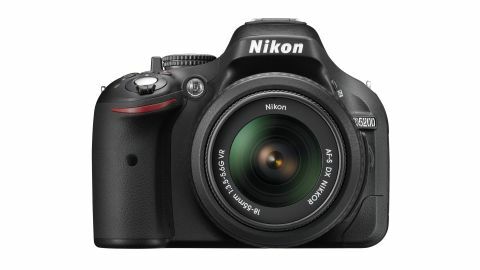 Features-wise the Nikon D5200 is a blend of the Nikon D3200, Nikon D5100, D7000 and D7100, since it has the same pixel count as the Nikon D3200 and D7100, albeit with a different sensor. It also has an articulating screen like the Nikon D5100 and the same metering and AF systems as the Nikon D7000. The new camera's control layout, however, is very similar to the Nikon D5100's, and is more streamlined than the Nikon D7100's. Nikon has paired the D5200's 24.1 million effective pixel CMOS sensor with its EXPEED 3 processing engine, and this enables a native sensitivity range of ISO 100-6400. If light levels are very low, this can be expanded upwards to the equivalent of ISO 25,600. Whereas the D5100 has Nikon's Multi-CAM 1000 AF module with 11 focus points, including one cross-type, the Nikon D5200 has the Multi-CAM 4800 DX unit that is also found in the Nikon D7000. This means that it has a total of 39 AF points, with nine being cross-type, which should make the Nikon D5200's AF system considerably more flexile and effective than the Nikon D5100's. This may make the Nikon D5200 more attractive to photographers wanting to try their hands at sports photography, and these users will appreciate the fact that it can shoot at a maximum continuous rate of 5fps, up 1fps on the Nikon D5100. Another feature borrowed from the Nikon D7000 that improves upon the Nikon D5100 is the 2016-pixel RGB sensor for light metering and white balance assessment. This feeds information into the improved Automatic Scene Recognition system that attempts to match the exposure settings, autofocus and white balance to the scene. According to Nikon UK's Simon Iddon, product manager for DX products, the size of the minimum recognisable target for the Automatic Scene Recognition system has been reduced since the D5100, making it more precise. Its tracking performance has also been improved so that the camera is better able to expose faces across the frame. Like the Nikon D5100, the Nikon D5200 has a collection of Special Effects and an in-camera HDR mode that combines two shots to create one image with greater shadow and highlight detail. Unfortunately, both modes can only be used when shooting just JPEG files. Naturally the Nikon D5200 is capable of recording Full HD videos, like the Nikon D5100, but the frame rate range has been expanded to include 60i and 50i as well as 30p, 25p and 24p. This should make for smoother footage of moving subjects, and gives scope for creating slow motion movies. Priced at £819.99/US$899.95/AU$1,047 with a 18-55 VR kit lens, the Nikon D5200 is in the same kind of price bracket as the Pentax K-5 II and Fuji X-E1, among others.